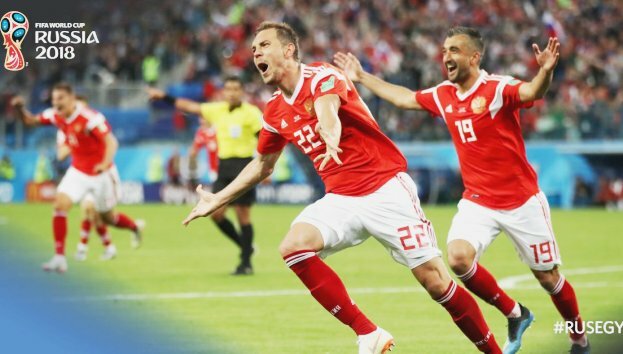 Russia defeated Egypt 3-1 in a Group A clash on Tuesday to virtually assure themselves a place in the next round of the FIFA World Cup here. An goal by Egypt defender Ahmed Fathi (47th minute) opened the scoring just after the break. Denis Cheryshev (59th) and Artem Dzyuba (62nd) produced two superb strikes in quick succession to give a formidable lead. Star forward Mohammed Salah converted a penalty in the 73rd minute to score Egypt’s first World Cup goal since 1990. Russia, who have won two matches on the trot, lead the group with six points. They had thrashed Saudi Arabia 5-0 in the opening match of the tournament. Egypt, who had lost to Uruguay in their first match, are yet to open their account. They will now have to beat Saudi Arabia in their third match and hope that the South Americans slip up in their remaining games. This has been a disappointing campaign for the North Africans who are making their first appearance in 28 years at football’s biggest stage. Salah, who has made a rather hurried comeback after dislocating his left shoulder during last month’s Champions League final, took the field for the first time since that fateful day. But the Liverpool FC star found the going tough against the well organised Russian defence. Although the Egypt midfield did well, they lacked teeth upfront. Both teams were more or less equally matched and both had their share of half chances in the first-half. The game burst into life after the break when the hosts took the lead. Russia were lucky to score on that occasion as a rather hopeful attempt by Roman Zobnin took a deflection off Fathi’s knee and was diverted into the net. However, there was nothing lucky about the hosts’ other goals. The Russians doubled their lead when Mario Fernandes did brilliantly to make room on the right inside the penalty box before cutting the ball where Cheryshev punished Egypt for some sloppy man marking with an excellent finish. It was the third goal in two games for Cheryshev. Dzyuba virtually sealed the victory when he chested down a ball from Ilya Kutepov before finding the target with a powerful shot at the near post. Although rattled, Egypt did display some urgency and earned a penalty — aided by VAR replays — when Salah went down just inside the box.